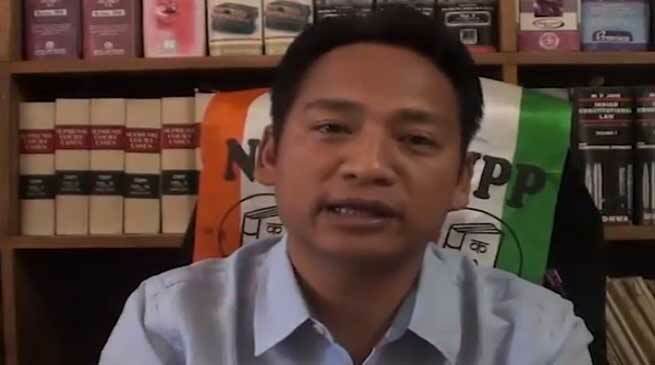 National Peoples party (NPP) candidate from 13 Itanagar assembly constituency Techi Tolu Tara appeal one and all including the youths to come forward and participate in the festival of democracy. Tolu while addressing the youths said that time have come and the youths who are the future of tomorrow need to wake up and come forward and join hand for the development of state and country. The root cause of the lake of development in state and country is the corruption and one cannot fight the menace until the youth force come forward the shoulder their responsibility as a good citizens of the country for its all round development in all front. Emergence of technology have been taking place but it should be utilised for better output and the skill development will naturally help the un-employed youths in getting the employment for sustainable development. There are lots of untold suffering of the denizens of the twin capital city like acute shortage of drinking water supply in all the residents, black marketing of LPG cylinders, traffic jam, haphazard parking, lack of full proof health care facilities, high rate of transportation fare/ school fees, sky rocking price of essential commodities and the common people are facing and there is a need for change of guard. He said. Highlighting his agenda and priority Tolu said first we need to change our mindset and should not encourage any such things which are not in the interest of general public. Do not encourage money culture in election, he suggested not to take any cash and kind in lieu of vote which is one of the most important weapon of the democracy by way of electing a good leader who can work for the society. He allege that the law and order situation of the state capital is deteriorating day by day and for the safety and security we as a civilised citizens have to support the state government, district administration and police to contain the rise of crime. He said. He said the vision of the leaders should be bright and people friendly but in many occasion it is negative and after election the leader hardly visit and bother to the people welfare measures. He however said that he have decided to work for the interest of common masses and development of state capital and urge upon all to extend support for making Itanagar a model capital city where people of all cast, creed, religion, rich and poor live with communal harmony in peace and prosperity. Tolu added.